Everywhere basketball fans turn these days, they see the growing presence of PEAK footwear. EuroBasket 2013 MVP, Tony Parker, is wearing PEAK shoes when he makes his daring drives into the lane for France's national team, and the San Antonio Spurs. PEAK has a very strong connection to international basketball. The company is the official and exclusive footwear partner of FIBA worldwide. 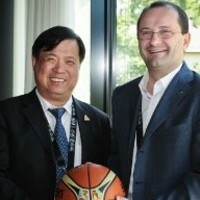 This week, PEAK Chairman Jingnan Xu travelled to Switzerland and held important meetings with FIBA. In doing so, he visited the House of Basketball and it made a big impact on him. "I believe as a family member of international basketball, now we have a home," he said. "This is my first impression. This home is not only for FIBA, but for all of the people who love basketball." Xu soaked up a lot of basketball history on his visit. There are fantastic displays in the House of Basketball. He also saw firsthand a lot of work being put into the various initiatives of FIBA, many of which are aimed at developing the sport. "I think it will be an inspiration for us," he said. "I always believe that FIBA has basketball in its heart and not only wants to improve basketball in one region, but all countries. This is the same goal as PEAK. "I believe that when FIBA and PEAK joined together, the biggest reason is that we want to grow basketball globally." As for his company’s aims, Xu said: "FIBA have helped PEAK a lot. "First, we want to be an international brand with the help of FIBA and second, PEAK is always more involved in basketball, so this is a perfect position. "We are also facing a very competitive market in the future. It’s very lucky that PEAK have done a lot of adjustments to meet these challenges and to prepare for the future. "Now we have finished almost all of our adjustments internally, so now we are preparing our strategy for the next 10 years. "This is one reason why I have decided to visit Europe and see our close partner, FIBA, and to see some sports in Europe. There will be a lot of interest in the Basketball World Cup in China, and that’s even with the national side not among the 24 teams taking part. The Chinese came up short of the top-three finish at the 2013 FIBA Asia Championshipthat was needed to qualify for this year’s basketball extravaganza. "2014 will have important events for PEAK" Xu said. "The most important part is always China. It’s a very big pity that the Chinese national team isn’t playing in the Basketball World Cup, which creates a big challenge for us". Even so, the goals remain the same for PEAK. "We have the basic strategy of increasing our sales outside of China as well as continuing our growth in China," Xu said. "Basketball will always be in an important part of strategy for PEAK."